Yo Seol (left), a senior at the California Academy of Arts and Science in Carson and a 2015 Edison Scholar, plays first violin in the high school orchestra. Athena Chen, a senior at Diamond Bar High School who was selected as one of the 2015 Edison Scholars, checks a lab experiment. Athena Chen, one of the 2015 Edison Scholars and a senior at Diamond Bar High School, checks two vials during an experiment. Jennifer Villacis, a Pomona Catholic Girls High School senior and a 2015 Edison Scholars award winner, assembles a project in robotics class. Jennifer Villacis was recently awarded a $40,000 Edison Scholars award that will help pave the way for her to attend USC. Jennifer Villacis remembers the day when students in her sixth-grade class presented their “what-I-want-to-be” projects. When her turn came, Jennifer said she wanted to be an engineer, a dream her Ecuadorian mother had, but was never able to achieve. “I saw this guy in the corner of the room say, ‘Oh, girls aren’t good in math. They can’t be engineers,’” she recalled. The other boys all laughed. Jennifer, who has always been good in math, proved them wrong. 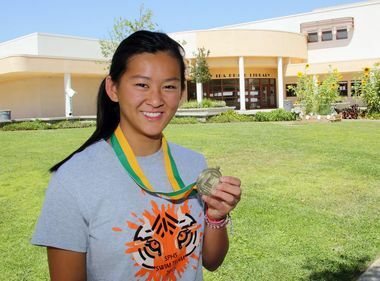 She will enter USC this fall as a civil engineering major with the help of a $40,000 Edison Scholars award. 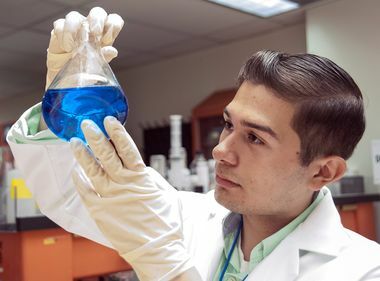 Edison International, parent company of Southern California Edison, created the scholarships to help minority, low-income and underrepresented Southern California students who want to major in science, technology, engineering or math (STEM). The money is paid over four years. Jennifer, a Pomona Catholic Girls High School student, was among 30 high school seniors out of nearly 2,800 applicants to be awarded one of this year’s scholarships. Although accepted at USC, Jennifer worried that the university’s student aid fell $10,000 short of what she needed. Like Jennifer, Athena Chen was inspired by an incident in sixth grade, but in a different way. She was playing at a piano recital when a girl in the audience with Down syndrome suddenly jumped up and began dancing. “Although we couldn’t convey our feelings to each other, we shared a moment that compelled me to help disabled people,” said Athena, a senior at Diamond Bar High School. Athena got an early acceptance to Northwestern University near Chicago where she will major in math and economics. She wants to use her degree to do statistical analyses of disabled communities to help frame public policy. She said the Edison Scholar award came as a relief because she won’t have the distraction of worrying about college financing. “With this $40,000 award, I will be able to focus on my education,” she said. Yo Seol’s plans for college also got a boost after he was named a 2015 Edison Scholar. 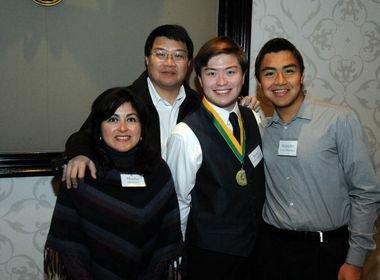 A senior at the California Academy of Math and Science in Carson, Yo was accepted at USC, but his heart was set on Georgia Tech, which he thinks has the best electrical engineering program for him to specialize in nanotechnology. His goal is to develop nanochips that can be used in medicine after he had his own scare with thyroid cancer. Yo was diagnosed when he was a high school sophomore, but he wasn’t sure he could get treatment because his parents had no health insurance. A family friend in Korea arranged for Yo to get surgery there at a much-reduced cost. The surgery was successful, but the incident inspired Yo to want to create a less-invasive treatment using nanotechnology. Ultimately, Yo would like to use his engineering education to help people in developing countries.